Looks like Xbox 360 owners will get to eat more worms, as Australia's classification body has rated Worms Armageddon Decade, a release that appears to be a Live Arcade remake of the ten-year-old strategy title. While XBLA already has one Worms release, now about two-years-old, Worms Armageddon Decade represents a highlight for the series. 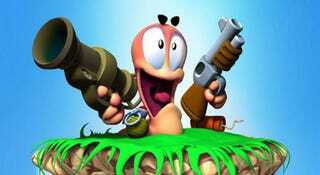 The original Worms Armageddon landed on the Dreamcast, PlayStation, Nintendo 64 and PC in 1998. Un-fun fact: it's the only Worms game I own. As GamerBytes points out, it's quite possible that Decade is a Live Arcade "exclusive."